I'm trying to find rainbow shiners but only finding these guys and Alabama shiners. Does anyone have an ID for this fish? Blacktail Shiner? What drainage in Alabama? Thanks for the info! This was Cheaha Creek just east of the Talladega National Forest. I've been looking for stock in my 125 gallon darter tank. Here's a great tool to see what species you may be finding. Based on that location, I'd say Blacktail Shiner, Cyprinella venusta. Cyprinella make great aquarium fish. Josh -- What distinguishes that fish as a Blacktail and not an Alabama shiner? No idea, Alabama fish aren't my thing. Just throwing a guess out there. They are pretty darn similar looking, is there a trick to them? Asking anyone. More orangish tail made me think Alabama but I didn't want to say since the OP seemed to already know what those were based on his first description. I've never seen either of these in person. I looked at the Peterson's guide, and based on the descriptions of both fish, it seems it would be hard to distinguish the 2 apart as they have similar description. I changed the topic title -- that might draw more GA/AL folks who know the Coosa basin species. Good topic titles give better responses! I was in Michael's camp, I assumed Alabama shiner was not on the table, so blacktail kind of made sense to me as well. Bet Dustin can help out with this. I have looked at this thing a ton. I know it's silly but I wish the photo was better and that it was properly oriented. I had decided that I thought it was venusta based on the spot, but now I am fairly certain that it is callistia. The reddish iridescence on the flank of the fish above the lateral line and the orangish colored fins are what make me think that. It also appears that the fish is more cylindrical than compressed. Venusta rarely get color in their fins except for during spawning and then their fins typically turn yellow and white. A non-breeding fish typically has little to no fin coloration though I suppose that could be dependent on habitat, water clarity and other factors. Venusta are typically laterally compressed like a typical shiner while callistia are more barrel shaped, more akin to a Nocomis without obviously going that far. The caudal spot is tricky since venusta is so wide ranging, the position and size can vary slightly. It does appear that the caudal spot bleeds into a couple rays into the caudal fin on venusta while it typically does not bleed into the caudal fin on callistia. For the OP, if you are finding venusta and/or callistia, you are looking in the wrong place. Both of these fish are typically found in larger streams than rainbows. wow I really like that answer... because it agrees with me (sarcastic giggle). I will say, that I know at least one spot in North Georgia where there are tricolors, alabamas, coosa, and rainbow shiners all in the same stretch of water. I wonder if there is a smaller stream feeding into the stream where you typically collect. It is certainly possible, but it seems as though rainbows are typically found in smaller streams. All of this is why field experience is so great for ID'ing fish. All of these little things you won't find in most ID books. You're right D, its actually the other way around... this is a small enough creek to have rainbows and darters and such... but is only a couple hundred yards (like river yards) from the confluence with a larger stream. 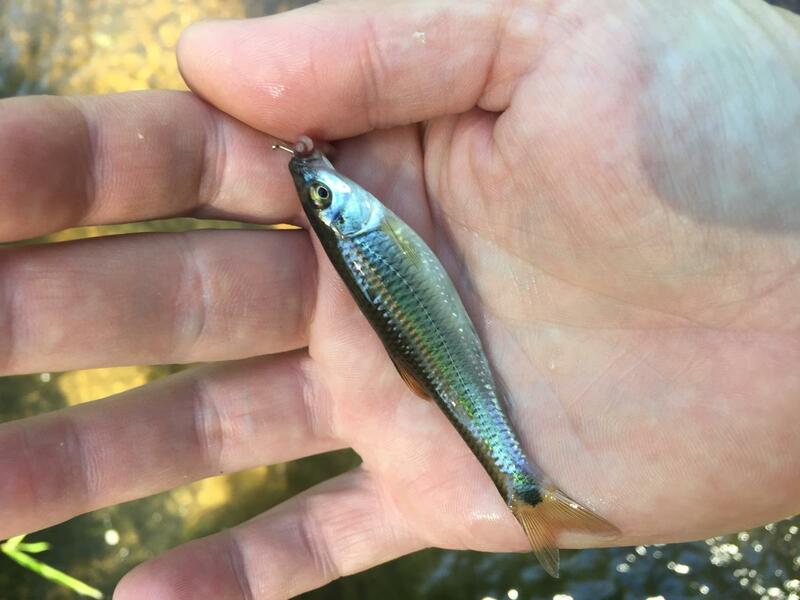 So if you followed the link, we find smaller shiners and darters and even lamprey in the stream... but also the occasional juv. coosa bass and bullhead and Cyprinella. I just wanted to give the OP some hope that there are places where they cross over. If you followed the link and saw the pictures you will see this is near Reinhardt University (a place I have often reported on). Dustin's description is excellent, and I agree with callistia. I think the shine on the scales are covering up the front portion of the caudal spot, giving us the appearance of that distinct squarish spot of venusta. As an aside, I was out yesterday in Dawson County, GA and the Nocomis are building nests and the Rainbow shiners are all colored up. Not spawning yet, but already getting on their fancy clothes. Sorry for the delayed response. I guess it could be a young Alabama Shiner. The ones I've caught in this stream have been twice this size and not as much or the rainbow coloration. I'm pretty sure it's not a Blacktail shiner, I've actually caught several of those from Logan Martin Lake along the coosa. They seem to prefer calmer waters, at least the ones that hang around my pier do. Sorry for the poor picture. Was trying to catch and release quickly as to limit stress.